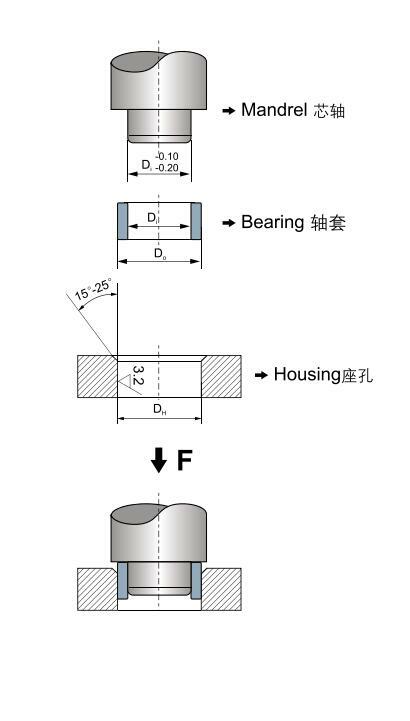 Typically,the bearings can be used to pressure the assembly with the installation,assembly,slowly push the mandrel should be used to prohibit the direct hit to avoid deformation of the bearing,the assembly should ensure that the seat before the hole smooth surface without foreign body. By liquid nitrogen or dry ice compared with cold press-fit assembly with mechanical press-fit method is more effective,then the standard freezing temperature of -40℃~-70℃ ，freezing time is generally 1 hour or more,according to the specific needs of parts of the wall thick and with tolerance. It is recommended to install the thrust washers and sliding plates with the hollow indented housings.To avoid the moving of such parts,a dowel pins is recommended to be installed.